The 2017 Oasis adds some nice features over it’s cheaper brethren though. 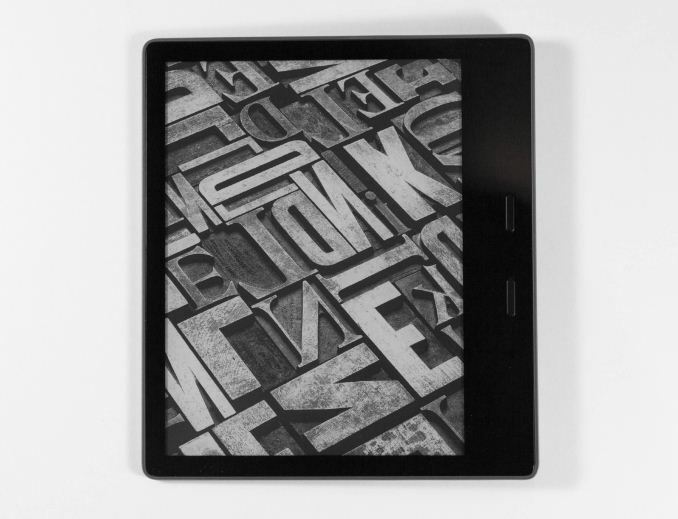 The once change that is hard to miss is the larger E Ink display, now at 7-inches diagonal, compared to 6-inches for the other devices. It’s still the same 300 PPI display as offered in both the Paperwhite and the Voyage, but with additional LEDs for a more even lighting. The Oasis is also made out of aluminum, rather than plastic, and is thinner and feels lighter than the other models despite the larger display. It supports Bluetooth for headphones or speakers, which lets you use the device for Audible audiobooks, and for those that like to use their Kindle around water, it’s also IPX8 rated meaning it’s able to be dropped in water and still function. 6.3" x 5.6" x 0.13-0.33"
So with a new body, bigger display, and IPX8 rating, does the Kindle Oasis tick all the boxes, and make it the device to get? Let’s dig in and find out. In regards to not including Kobo, the article title clearly states the review is about the Kindle Oasis (2017). If you want a review of the Kobo models, look for one of those. You can buy ebooks directly from publishers. O'Reilly and InformIT provide PDFs, MOBI, and EPUB - all of which are supported by Kobo Aura ONE. For my needs, this is enough. Kobo is fairly popular outside the USA. My dad has the second-gen Oasis and it's pretty darn nice. A lot nicer than the first-gen Oasis. Also doesn't have the split battery design of the first gen either (which in hindsight had issues like the case flying off). Though I would still recommend the case for protection and grip.